Lewis Hamilton and Valtteri Bottas were set to win the race in amazing fashion but thanks to car troubles, both of them did not finish the race. Thanks to that, Max Verstappen took full advantage of it to win the Grand Prix. Mercedes was just having a bad day. It started first with Valtteri Bottas having transmission problems which forced him to retire. Then the team strategist decided not to pit Lewis Hamilton at a crucial period. When he did go in to pit, he emerged 4th place from 1st place. This was Mercedes’ first double DNF since 2016 and ended Lewis’ 33-race streak with points. Nico Hulkenberg’s engine blew up and Daniel Ricciardo had gear sync issues. That meant that plenty of other racers were in the points this race. Verstappen finished first in spectacular fashion followed by the two Ferraris. “I’m so happy to win at the Red Bull Ring, and with so many Dutch fans here. It was also so unexpected, and that makes it even better. An amazing weekend. If you want to win a race this is the perfect place, in a Red Bull car at the Red Bull Ring. For the race I was very happy in general with how the car was behaving but I always just try to do my best race possible; if that is going to be first, second, third, it’s not in your hand. From my side I felt in control, I was driving to the best I could with the car I had and at the end we were struggling a little more than Ferrari with the tyre blistering but we managed to stay ahead. I knew that Daniel and Lewis had to pit again and I didn’t want that scenario so I was not driving to the full limit of the car but just managing everything. It was tougher than perhaps it looked but I just needed to be on top of my tyres. I’m very thankful to the engineers for making that strategy call under the VSC and full complements to the team for that pitstop, because that definitely made our race. The fans in the grandstand were great, so many orange t-shirts there. My focus was always on the track but for the last few laps I could look a little bit to my left and they were really cheering me on, it was amazing,” said Max Verstappen. 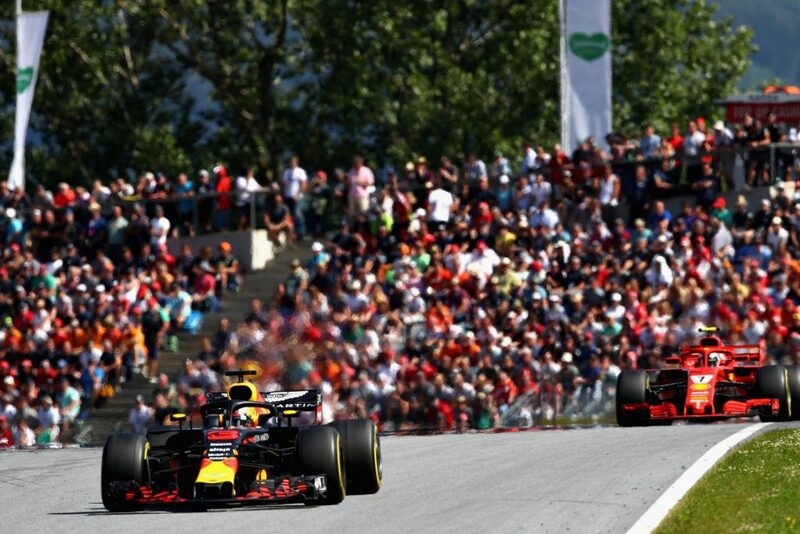 Max Verstappen’s fourth victory in Formula 1 ties Eddie Irvine and Bruce McLaren for the most wins by any driver without ever taking a pole position in his career. Kimi Raikkonen secured his fifth podium of 2018, and tied his best finish on this track from 2003. Sebastian Vettel’s third-place finish coupled with Lewis Hamilton’s retirement means the German now leads the world championship by one point. Hamilton fell one lap short of being a classified finisher, bringing his 33-race points streak/finishing streak to an end. Team mate Valtteri Bottas also saw his 23-race finishing streak end. Romain Grosjean’s fourth place is only his second top-four finish of the turbo-hybrid era (he came third at the 2015 Belgian GP). And his team mate Kevin Magnussen’s fifth place tied his best finish of the year, and he’s now scored twice as many top-six finishes in 2018 (4), as in the rest of his career combined (2). Esteban Ocon and Sergio Perez came sixth and seventh at Force India’s 200th Grand Prix – it was the first time they’ve had two cars in the top seven this season. McLaren’s Fernando Alonso finished eighth from the pit lane to end a three-race scoreless streak. Sauber had two cars in the points for the first time since the 2015 Chinese Grand Prix. Speaking of Sauber, Charles Leclerc has scored in five of the last six races, only beaten by Vettel (six out of six).